We recently upgraded to CS5.5 and noticed InDesign thumbmails no longer will save to be viewed as spreads in the content viewer of Bridge. We work on many catalogs and brochures and need to see the entire 2 page spread in the thumbmails in Bridge to efficiently work on our projects. These projects are over 500 pages in length so using the preview window and clicking through pages for each file is NOT working for us. Tell me how to make the InDesign spreads show up in the thumbnails in the "content" pane of Bridge.... Help please! Unfortunately, there is no way to view InDesign documents as reader spreads in Bridge, in the current version of the products. Enabling this feature is something that is being considered for a future release. I'm beyond frustrated with Adobe because of this issue. The person(s) who decided to eliminate this feature in CS5/CS5.5 should be fired. Seriously. I realize this is most likely a Bridge issue and not an InDesign one, but these two applications used to work side by side in a way that I, a catalog designer, found extremely useful. I always thought the intention of updating software (and not inexpensive software, I might add) meant new, useful features were being added, not eliminated. I hear Quark is making a comeback. If Adobe keeps selling me downgrades marketed as upgrades, I might have to jump ship. Ditto! Here here! We have an entire catalog department at your back, Gregg! We have the same issues with Adobe. You go, dude! I too am a magazine designer and have just sent a request to Adobe to add an option in the Preferences > Saving InDesign Files > Pages > "Spread View." This would allow Bridge to show spreads and not the single page view is now shows. I'm guessing this will work because I can view InDesign CS4 documents in Bridge CS5.1 as spreads, but once they are opened and saved in InDesign CS5.5 the no longer show spreads in Bridge. I wonder how many of us need to make this request and suggestion to Adobe before they put it back!? If Bridge can show ID4 documents, but not ID5 documents - then the most likely source of the change is in InDesign. Please let the InDesign team know that you want this functionality restored (they don't read this particular forum). Why don't you let them know. You work for the same company. Good grief, what an inane comment. Sounds like Adobe will be going under with this pathetic attitude. The right arm doesn't know what the left is doing. Way to go! Exact same boat here with this problem. We would love to upgrade from InDesign CS3 to the newest version but this is the only reason why we don't. Every time a new InDesign comes out, we download the trial to have a look, and still, NOTHING! This has been going on for years and every time people like us ask, we get ignored. Why this was removed at all is beyond me. Why remove something that isn't broken? Frustrates us to no end!! That's a good question, Michael. I don't think Adobe has actually read these forums. I do know that their monitors don't read them carefully enough. This one guy actually told a questioner that he must be the only one, because he's never seen it before on the Forums! DUDE! Read the forums! You work for Adobe! What's up with that? We do read the forums, which you would know if you read them. This topic makes me feel angry at Adobe. I wonder why a company that services so many millions could not take note and make strides to address the complaints of the now-becoming many customers that use InDesign and Bridge for creation and preview of their spreads. There are more of us than not who used a very successful preview agent from Adobe that they just decided didn't need this preference anymore! Who made this decision? Do they still work for Adobe? WHY? This particular forum is for the Photoshop family of products. But you're talking about a change in InDesign and how it writes it's files -- which the InDesign team won't see because they don't read these forums (and even if we forward the discussion, they won't see enough of it to take notice). Since I just posted it, I'm not sure if this link will take those of you who'd like to add comments to it (hi Gayle! ), but try it. If it doesn't work, I'll post an updated link later. 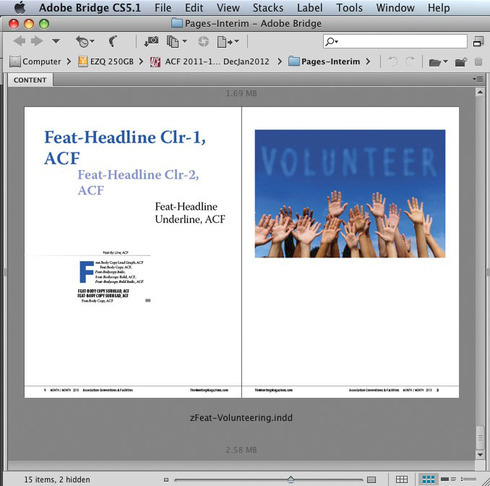 For several versions several people have asked for the inDesign spreads to appear in Bridge. This is an option that should be restored. It did in CS3 and was dropped since. Too valuable an option to leave off. Please restore it. Bridge: Ability to view InDesign spread previews. Why can't I view spreads in Bridge anymore? This was a great feature and now its gone. Unbelievable. So much for product improvement. Can't view InDesign spreads in Bridge anymore - Useless!. Reinstate preview feature from previous versions of Bridge to Bridge CS6! Pretty please!. I realize this is largely an InDesign issue, but I am trying to get some attention to the problem. Our company is updating to CS6 and needs to be able to view InDesign files as spreads as we did in CS3. We produce many catalogs a year and each spread is a separate file. We use Bridge (CS3) to view the entire catalog at once. Now, with CS6, we can only see one page of the document, even though the preference is set to 2 pages in InDesign. InDesign does not write metadata that Bridge can use to show the spread. We need an update. Please help! We just upgraded from CS4 to CC und have the same issue here. We really need to see the spreads in Bridge. Single pages as previews are worthless to us. This really breaks the workflow. Please restore this!